Okie dokie, see you Thurs! I may as well join in on the commenting fun. Love The Meek. Liking Mare Internum. Your warm, expressive, anatomically believable style is wonderful. I like the way Bex’s Nigerian accent/vocabulary gets stronger when she is startled. It’s also good to see Mike actually *reacting* to her display of exasperation. Hehe, he actually shrinks down in front of her. It’s not so good to see the manic look in his eyes. Poor fellow. Pretty sure it isn’t as easy as is made to look. Names are just designations. Poor excuse for a unique identifier. No more important than you let them be. I’ve interacted with people for years before without knowing / remembering their names… and without them even being aware that I never used them. Panel 5 is the best thing ever BTW. Love the thumbbeams. And those fanarts are both great! Beautiful colours in Annaspath’s! Bex reminds me of one of my cousins. I love her so much with each page. I just love the page. Well, keep loving all of them, to be fair. I can only guess at the story, so everybody gets the benefit of doubt ’til proven otherwise. Bad communication just happens sometimes. The Meek and Mare…? PLEASE be careful not to overextend yourself! “He smiled with a curious kind of manic joy… He had a major piece of unfinished business that he would now be able to attend to, and was terribly pleased that life had suddenly furnished him with a serious goal to achieve.” – Douglas Adams. Hahaha, yeah me too. Also people tend to introduce themselves like, once, how is anyone supposed to remember that. It always helps to have people believe in you. Almost makes you think there just might be a reason to maybe believe in yourself. I love the radiance around his thumbs-up. Haha, Mike reminds me of myself in a bad way – I never remember names unless I FOCUS on remembering them so I walk about not knowing names of new acquaintances for an awkwardly long time (I hope none of my uni classmates are reading this comment). Though, I feel the first panel on this page would be even more effective if the panel had the entire row for itself, so that she really feel alone for a moment before Mike pops back in. But I really love the flow of the comics you make! Just stumbled on this while looking for more art styles to learn new techniques from, and fell in love. Your pacing is really smooth and I really dig your expressions. Reminds me of TJ and Amal a bit. Much love, and keep up the good work. I’m looking forwards to seeing what’s in the cave! Thanks! If you like this comic, you’ll also probably enjoy my other comic The Meek. Thanks for reading! Haha, I love the comedic timing of this one. The last panel still has me grinning. “Abi” oh gosh I’m in tears. Abi is a Yoruba expression that roughly means something like “Come on!” or “Really?”, “Seriously” “For Realz?” stuff like that. 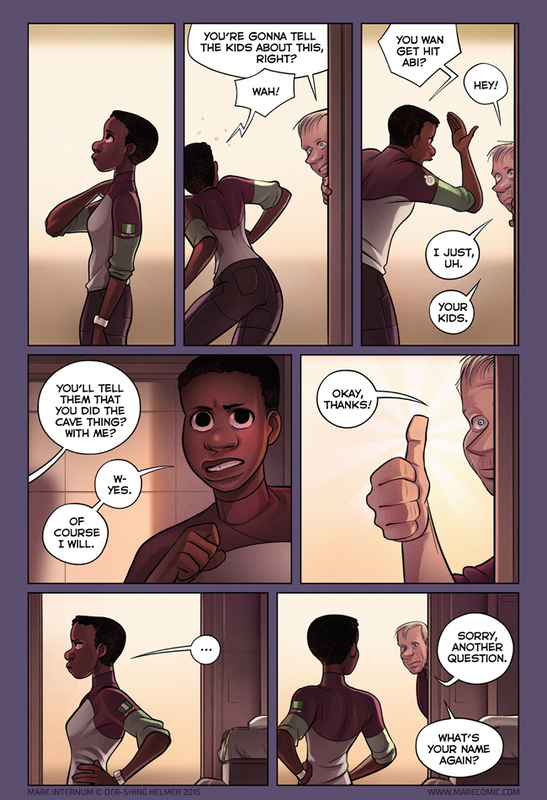 Bex’s eyes seem a tiny bit off in that fourth panel; intentional maybe? Lazy eye? Love this comic, btw. This is my fourth or fifth time reading it through, though this is the first time I’ve read all the comments as well. Really enjoying the discussions and insight. I’ve discovered details I would have otherwise completely missed had I not checked out the comments. Haha, you’re right, no it’s just me not doing a good enough job. I’ll make a note to nudge it over. Omg as a fellow Nigerian I am in love with this character.